First time home buyers may borrow from their RRSP savings to use for a down payment, or other costs related to buying a property. 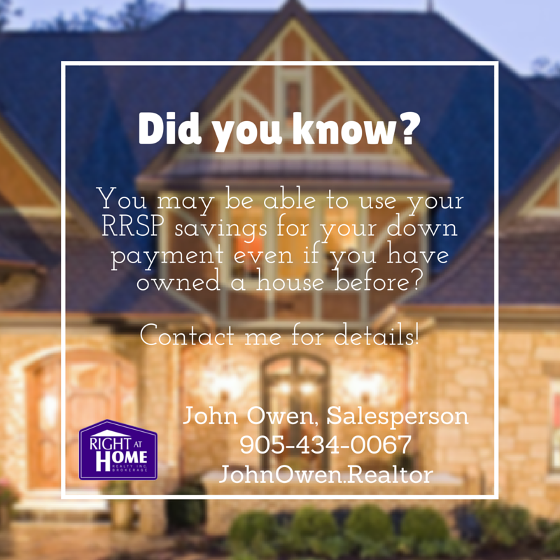 In fact, it may possible to use your RRSP savings to use toward buying a home, even if you are not a first time buyer. Under the Home Buyers' Plan, you can use up to $25,000 of RRSP funds if you (or your spouse or common law partner) haven't owned a home that was your principal residence, within the last five years (approximately). The money you can withdraw needs to have been in your RRSP for 90 days, and can come from more than one account, provided it is in your name. These withdrawals cannot be used for rental or investment properties. Couples buying together (not necessarily spouses), can each access up to $25,000, or $50,000 total. If one of the buyers does not qualify under the program, the other may still do so. The money is not taxed at the time of withdrawal. Also, the money may be used for down payment, as well as closing costs (like legal fees, land transfer tax) or even improvements, furniture and appliances. You don't need to wait until you have purchased a home, either. You can withdraw the funds, and then purchase your home within the same year or before October 1 of the next calendar year. You will, however, have to start paying back 1/15th of the amount withdrawn each year starting with the second year following the withdrawal. If you don't pay back each year, the amount will be added to your taxable income. If you would like to explore this program further, you can visit Canada Revenue Agency's website, or contact me at 905.434.0067. I would be pleased to help you get that home of your dreams!